Hi Friends: There is a new challenge today over at the Stinkin' Inkers Challenges Blog, where the current theme is Color Wheel - use your favorite color combinations. 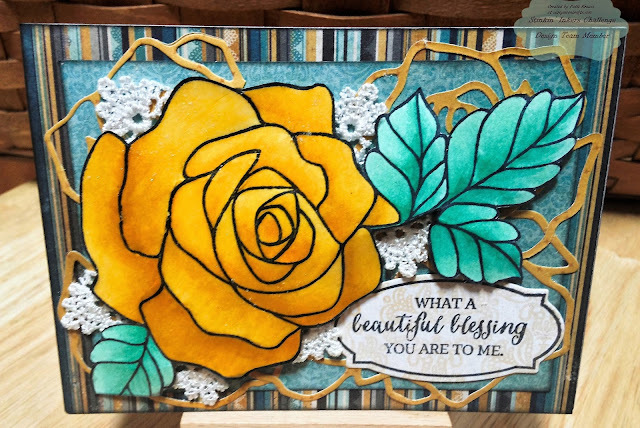 I hope that you are inspired by my creation and will join us over at the Stinkin' Inkers Challenges Blog to see the creations of the other design team members and enter this fun challenge. Stamp rose image onto smooth white cardstock and color with Spectrum Noir Markers, then cut out the image. Shape rose with flower shaping tool, then add Glitter Brush marker to rose. Cover rose with Glossy Accents and sprinkle with ultra-fine glitter for more shine and sparkle. Cut striped paper to fit A2 card base. Add matching patterned paper layer to top. Cut 5 smaller roses from the yellow patterned paper using the die and layer over the center panel on the card. Add the rose image to the card with foam squares. I doubled the squares in the middle of the rose for more dimension. Stamp the sentiment and frame onto coordinating paper and cut with the matching die. Add to the lower side of the card. Finish with some lace tucked behind the rose petals.